Hi, my name is Olivia. I was born in South Africa and moved to New Zealand when I was thirteen. While in New Zealand I received my Bachelor of Education, specializing in Montessori. After graduating, I spent 2 years teaching in a classroom with 5-11 year olds. When I first came to Canada around 3 years ago I lived in downtown Toronto. My first position was a 3 month live-in nanny to a 6 year old and 3 year old. I then moved on to work as teacher in a Downtown Montessori daycare. I worked with children aged 9 months to 6 years old. Spending most of my time in the toddler classroom. After that, I was a nanny for a two year old boy. This role included daily outings to parks, splash pads, libraries, drop ins, aquarium, play dates and I took him swimming. 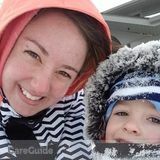 I moved to Ottawa for a year and a half and spent time as a nanny to twin toddlers. At the end of March, I moved back to Toronto and now live in Ajax. I have my first aid and cpr-c (expires in Aug, but will renew). Willing to get a new police check if needed. I have a clean driver's abstract and a reliable vehicle. I absolutely love working with children and enjoy seeing them learn new things, get excited by the world around them and accomplishing milestones. I enjoy doing activities both outdoors in nature and indoors. I consider myself to be very creative and I love finding new fun activities to do with kids. I am a fast learner and a very willing and hardworking person.